The shirt should be made from a natural cream-colored jersey knit or other stretch fabric with a V-neck formed by one side of the shirt wrapping over the other. a. The wrap should be right side over left side. b. Fabric should be thick enough or layered/lined such that there’s no visible wrap line under the top layer. c. The shirt should end at the wearer’s hips. The bottom of the shirt is unfinished/unhemmed. d. The shirt has a collar the shirt attached with visible stitching. e. Back detail: an arch detail goes across the shoulder blades on the back of the shirt. It stretches the entire length of the back of the shirt from armpit to armpit. The topmost part of the curve is approximately 3 inch (7.6 cm) from the base of the collar. This detail can be achieved through a seam or interfaced under layer. f.OPTIONAL but RECOMMENDED:The edges of the neckline, collar, and underarms are finished with a blanket-stitch or whip-stitch detail. The pants should be made from medium to heavyweight fabric. Twill or suede-cloth is preferred.Color is in the range of olive/taupe/tan. a. The pants are fitted and the full length comes to just below the knee. b. The pants should have a side slit at the outside of the knee that goes about half way up the knee pad, approximately 4 inches. c. The knee pads are quilted with five oval sections. (OPTIONAL but RECOMMENDED:The knee pads are weathered). d. A horizontal seam goes around the upper leg, approximately 1 inch above the top of the knee pad. (OPTIONAL but RECOMMENDED: the seam is finished with decorative whipstitching). The wraps should be made of a textured fabric in a cream/off-white color. Stretch fabric recommended for mobility. a. Arm wraps must be weathered, particularly on the edges. b. Arm wraps start at the upper arm (mid bicep) and wrap all the way to the wrist. c. The end of the wrap should be tucked in to keep the wraps secure. d. A leather bracer may NOT be worn with this costume. Hair should be done in Rey’s typical “three knob” hairstyle. The knobs should be three small, neat loops starting high on the back of the head and evenly spaced to the bottom. a. A few loose tendrils hang from the face on both sides. b. No loose bangs are permitted. Any bangs should be pulled back into a small ponytail and secured in the top “knob”. c. All natural hair colors accepted. Brown preferred. d. (OPTIONAL) Strips of wool or similar fabric in the same color as the wearer’s hair are tied around the base of each knob. Dark brown wool or wool-like fabric and cork/leather/leather-like details. a. The soles are medium to light brown sole (slightly lighter than the main boot). b. The boot ends just above the ankle. c. The heel of the boot is cork (preferred), leather, or leather-like in a slightly darker brown than the fabric of the boot. A strip of the same material goes up the back of the boot. d. The boot is laced in the back by threading dark cord (leather or waxed twine preferred) through two leather or leather-like loops on each side and a single loop attached to the strip on the back of the boot. Ends of the laces are tucked in so as not to be seen. The belt is a dark brown leather or leather-like material that can hold the weight of the holster without sagging. a. The belt should be made from one piece that splits into the two belts. The joined portion is on the wearer’s left, and the separated sections and belt closures are on the wearer’s right. b. The top belt is narrower than the bottom belt. The top belt is approximately 1.25 inches wide, and the bottom is approximately 1.75 inches wide, proportional to the wearer. c. The belt has a twine detail on the front that wraps all the way around the full joined width of the belt a few times, and then a few times only around the lower belt. An additional piece of twine wraps only around the lower belt in the back. d. The top belt should fit snugly around the waist and the bottom belt hangs at the hip on the wearer’s right side. e. The belts have two D-rings or rectangular metal rings on the right side (used to take belt on and off) of top and bottom belts. The rings should sit to the side and slightly behind the front hip bone. On both upper and lower belt, the rings are secured on the front end by an X stitch, the other (back) end loops through the rings and then weaves back in and out of the belt twice through slits in the belt. Holster: a brown leather or leather-like holster is attached to the lower belt on the wearer’s right side, and should be the same color as the belt. a. A thigh strap secures the holster to the leg. The leg strap secures with metal rings similar to the belt or with a post in hole. (OPTIONAL but RECOMMENDED: the leg strap closure has an X-shaped stitch detail). b.The holster sides overlaps in the front of the holster, and an additional flap wraps up from the bottom of the holster. (OPTIONAL but RECOMMENDED: The front of the holster is secured with two weathered metal studs/rivets. c. A blaster is NOT worn with this costume. At least ONE item from this list is required FOR APPROVAL. It is recommended to troop with only one item or the other, not both at the same time. 1. Staff: The staff should be proportional to the costumer’s height. It should be about 6-8” (15.24 cm to 20.32cm) above the head of the costumer when held straight up. Two H-shaped leather “harnesses”, each with a metal D-ring, attach to the strap with snaps. The staff has a weathered tan strap that attaches to those D-rings with metal clasps. Staff is extremely detailed and will be compared to the photo references to determine closeness in detailing for approval. Staff is metallic black. All pieces should be weathered. 2. Rey’s Lightsaber (Skywalker graflex). 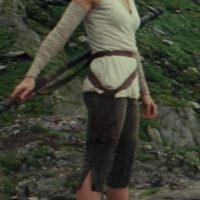 No toy sabers, no Ultimate FX short saber). The lightsaber may be a static prop (hilt-only). If bladed it must Blue.